Which houses will stay, which will be demolished? We’ve had quite a few debates about which houses will remain standing, and which have been earmarked for demolition in January 2009. Thankfully, Isabelle was able to superimpose our definitive residential map on to the projections for Seletar Aerospace Hub Park provided in EDB’s fact sheet. The School of Logistics and 2 houses at Hyde Park Gate will be removed to make space for part of the ‘runway dependent’ zone. 12 other houses st Hyde Park Gate will be demolished to accommodate a broader skirting for the runway. Incidentally, these houses are built on an elevation some 10 m higher than the existing runway. 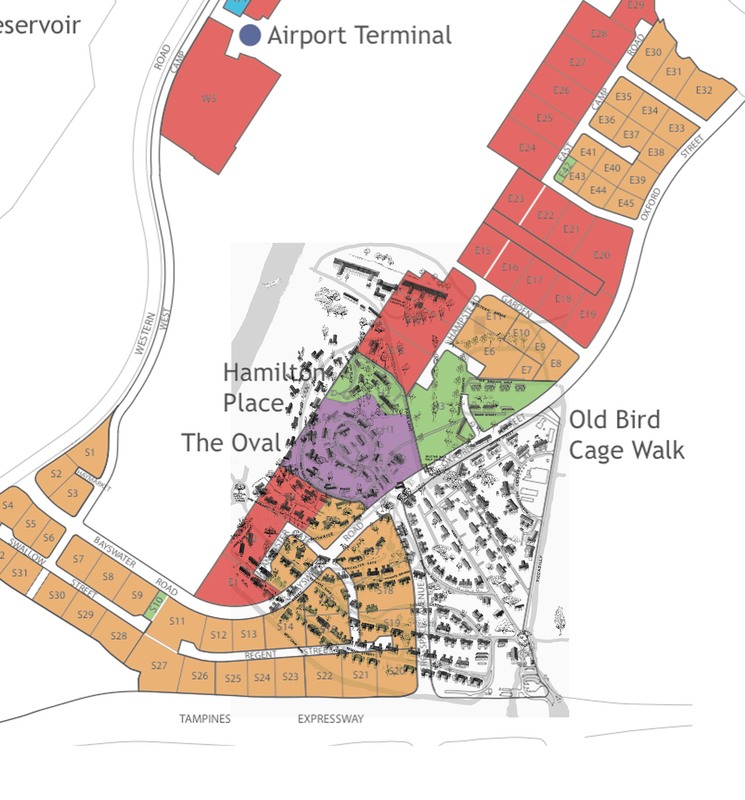 Much of Hamilton Place, Old Birdcage Walk and Baker Street will form part of the ‘commercial, recreational, F&B’ zone. The Oval, and some of Hyde Park Gate will make up the ‘institutional’ zone. Houses along Haymarket and Swallow Street will disappear to form the South side of ‘runway dependent’ zone. The Seletar Airbase Golf Club House, part of 3 Park Lane and 1 Hyde Park Gate will need to be removed to make way for the 6-lane motorway that will be running through the Aerospace Hub Park.